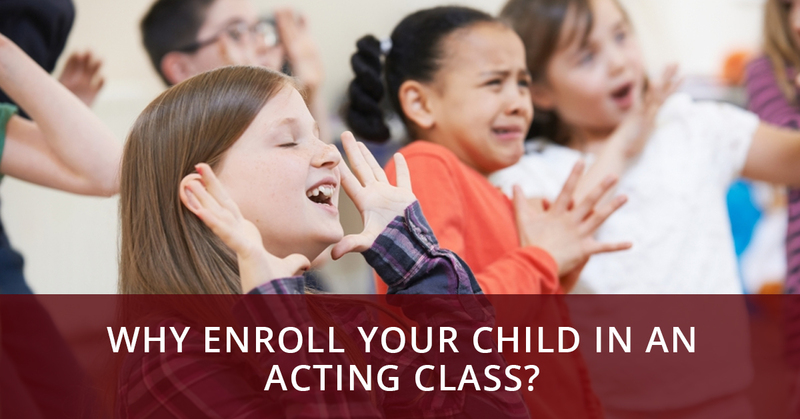 Why Enroll Your Child in an Acting Class? When you picture a theatre class for kids, you may conjure up an idea about a bunch of extroverted and fearless kids training vigorously for Hollywood fame. However, we at Soaring Dance Theatre know that theatrical training is beneficial to all children, regardless of their aspirations and personalities. What types of kids attend theatre classes? We have found that all types of kids attend our theatre classes and learn something new! The shy children are coaxed out of their shells and are encouraged to participate and speak up. The more outgoing kids thrive in this sort of environment and look forward to getting the chance to really take the spotlight and shine. No matter if your child is shy or if they love to be the center of attention, we know that at Soaring Dance Theatre, they will learn something new in our fun, non-competitive environment. How can drama classes help my child? While drama classes are designed to teach your child the basic ins and outs of theatre, they aren’t all about acting and dancing. Our classes are designed to teach your child confidence and fearlessness! Some kids are shyer than others and have a hard time mustering up the courage it takes to conquer the stage. By teaching self-confidence and bravery at a young age, these children grow up to be self-assured adults. Many adults struggle with confidence and public speaking. When children play games that teach them spontaneity, quick thinking, and confidence, these skills can carry them forward as they move through life. Even if your child is not destined for the big screen or even to speak in front of a large crowd someday, these skills benefit all our students as they age and go on to give school presentations or go in for job interviews. Not only will your child learn to conquer their fears on their own, but they will also experience the joy of being involved in a group and working together to create something new. We are sure that your child is used to being in a classroom setting, but imagine a setting where each person has his or her own part to create something new. Children who don’t naturally excel at fitting in tend to immerse themselves in the imaginary world of the game or scene they are working on along with their classmates. Even extroverted children might struggle with playing with the team instead of trying to take charge all the time. This is a skill they can develop in theatre classes. Of course, bringing your child into a new group where they get to play games and work as a team is likely to result in friendships. Since they will be working hard with similar aged kids, this presents the perfect opportunity to create new friendships. If you want to give your child the chance to make new friends, increase their confidence, and show them an incredible creative outlet, be sure to contact us at Soaring Dance Theatre in Monroe!